The incredible benefits of mechanical insulation are well-known for most industries and applications. But people often forget that, in order for a facility to actually reap these benefits, the mechanical insulation itself must be in peak condition. High-performing insulation doesn’t just require the right maintenance once it’s installed—it requires the insulation system to be specified and installed correctly from the beginning of the project. When mechanical insulation systems fail, the results are costly. Why? 1. Cost to replace the damaged system components and/or repair equipment. 2. System doesn’t save as much energy as it was originally specified to do—loss of bottom-line energy and cost savings for facility operation. First, why do mechanical insulation systems fail? The insulation was not specified correctly from the beginning, resulting in overall sub-par system performance. The mechanical systems were not designed or installed to accommodate the necessary insulation. The insulation was value engineered, compromising the integrity of the system. In new construction, the insulation was installed before the building was fully enclosed, resulting in exposure to weather and moisture. Insulation is installed in a high-traffic area and sustains abuses and damages over time. The insulation isn’t inspected and maintained regularly, so seemingly small problems become worse over time. What are the consequences of mechanical insulation failure? The thermal efficiency of the insulation system seriously decreases when it is not performing as specified. For example, in the United States, it is estimated that between 10-30% of all mechanical insulation is missing or damaged. When insulation is missing or damaged, it does not perform as originally specified, meaning that the facility will not save the energy it was intended to. Additionally, moisture has a negative effect on insulation systems. In fact, a one percent weight gain due to moisture can lead to a 7.5% decrease in thermal efficiency. That inefficiency leads to more energy escaping the process, which in turn leads to higher operating costs and increased energy bills. The reduction in the insulation value can eventually lead to a failure of the entire system and the need for serious repair and–more likely–replacement. Corrosion under insulation (CUI) is a well-known condensation-related challenge in the industry. Pipe corrosion under insulation is a slow but debilitating (and potentially expensive) problem. If the corrosion becomes too severe, the piping will need to be replaced, which will most likely result in shutting down the facility in order to complete the work. Between 40-60% of all piping maintenance costs are related to CUI. As with CUI, damage to mechanical insulation can cause moisture penetration, which can lead to mold growth. Mold is not only detrimental to the mechanical equipment, but could affect the health of staff and building occupants as well, especially if mold/mildew gets into the building’s HVAC system. Different insulation materials are susceptible to mold growth in varying degrees, so if mold is a concern then the specifier or insulation contractor will be able to specify the correct insulation type for the intended purpose. Mechanical insulation is an important tool for personnel protection in any facility, but that benefit becomes compromised when the insulation system fails. First, if insulation is missing or damaged, staff could be exposed to thermal burn hazards. OSHA considers exposed heated surfaces, if there is a potential for injury, to be a hazard and issues citations if employees can come into contact with such surfaces. 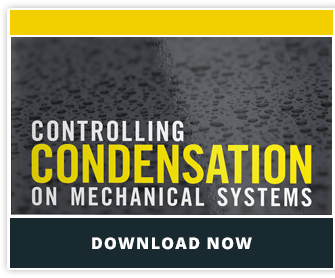 Condensation on mechanical insulation is also a sign of a failing system. Condensate can drip and accumulate in ceiling tiles or floors (and may even form ice), causing slipping hazards. It also has the potential to drip onto electrical equipment which presents the dangers of shock to workers and damage to expensive equipment. Condensate dripping can also contaminate any product that is being produced underneath the system. When mechanical insulation becomes damaged, one of the highest costs is a result of the downtime needed to repair the insulation and/or equipment.